So I haven't done a lot of painting before, but when I found this media it just clicked. I love watercolouring, and it really gets to me every time. It's where I can let go of the control in a good way. This course helped me a lot actually, finding new ways to think and I enjoyed experimenting. So much that I did some things before trying the final projects in this class. Well, here are some of the things I've done, and the projects! This is the feather, monochrome, in one of my favorite colors (Phthalo Blue). Haven't done anything like this, before or after this. But I think it looks good! Some minor flaws, but that's what you get for being impatient! I used round brushes in sizes 8 and 2. And this is the Sphere. I filled in some lines with a black pen from Muji (with a nice 0.25 point) to make it stand out a bit. But this was the hardest for me, I think it's really hard making it round! I have made quite a few of these, my space whales. 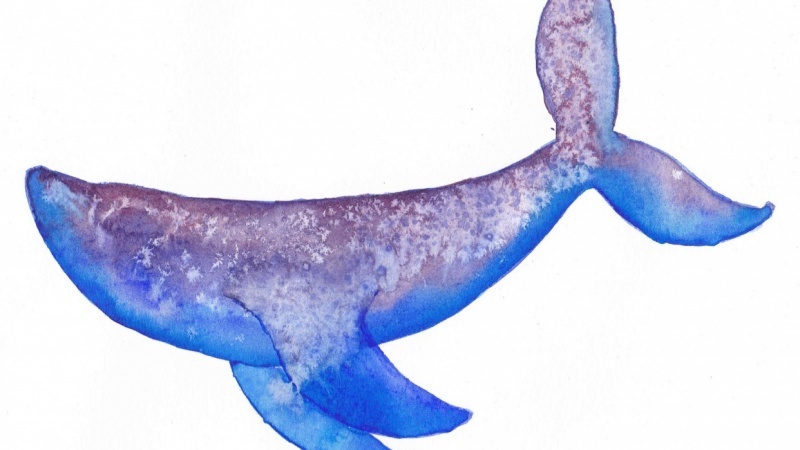 I have no clue as to which kind of whale this would be, and I had no reference when creating it, except for a picture in my head of how I wanted it to look. Here's an experiment with salt, that I don't quite master yet. I never get the same effect, and I'm curious to know how it actually works? These poppies I made when watching a Youtube video with Joanne Boone, when she taught how to make these loose poppies. I filled in these as well with the Muji pen, and it defined the flowers some extra! This is one of my favorites so far. Also I made these Lilacs, but I'm mostly fond of the stem of them, and how the brown made it look almost real. I'm still figuring out all of that real feel thing in pictures with watercolor, but this comes kind of close I think! Thank you for a great class, I learned a lot, and I shared it on my blog when I wrote about trying to learn watercolouring. I think there's a lot more to learn after this, but for a beginner like me, it's really great and encouraging!